Hulk, smash! And boy, does he ever in Avengers: Age of Ultron. The sequel to the biggest superhero movie of all time naturally has to be bigger than the first film. Expectations are sky high for writer/director Joss Whedon to bring back that magic and fun of the first one without suffering from sequel-itis. From the very first frame, we are catching our Avengers in the middle of an attack on a Hydra research base hoping to get their hands on Loki’s scepter. This attack also introduces us to two new characters, the twins Scarlet Witch (Olsen) and Quicksilver (Taylor-Johnson). They’ve been trained as enemies against our beloved Iron Man (Downey), Captain America (Evans), Thor (Hemsworth), Black Widow (Johansson), Hawkeye (Renner), and Hulk (Ruffalo). As Cobie Smulder’s Maria states, “He’s fast and she’s weird.” The battle ends with Iron Man obtaining the scepter, but only after the team is subjected to the twins’ powers of speed, magic, and telekinesis. Back at Avengers headquarters, Tony Stark/Iron Man is working on a new artificial intelligence project. He’s stuck at a breaking point and turns to Bruce Banner/Hulk and his scientific expertise. Their combined forces suddenly turn for the worst when this new A.I. generates itself and morphs into an iron body. It goes by the name Ultron (voiced by Spader) and becomes the Avengers’ greatest foe to date after he turns on his creators. 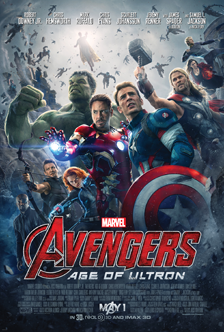 All Ultron wants to do is save the world…and kill the Avengers. One would think that after the multitude of Marvel movies that have been released since Iron Man in 2008, the franchise would grow tired and repetitive. You could say that this franchise mirrors The Fast and the Furious in that it only gets better with age. Now that we’ve been with these characters for quite some time, they feel like old pals with each new movie. It’s like you’re getting together with a group of friends you only see once a year. You feel that chemistry between the actors pick right back up again. Whedon knows how to write for these characters, who were originally created by Stan Lee. He plays into their banter like crazy with running gags and constant witty one-liners. Did you know Captain America hates profanity? It provides a nice balance to the heavy action side of the film and shows that Marvel doesn’t take itself too seriously. Finding that balance is key in these superhero movies. Whedon takes the opportunity in Avengers: Age of Ultron to dig deeper into some of the other Avengers who haven’t had their own stand-alone films by this point. So far we have only seen Jeremy Renner’s Hawkeye as a cameo in Thor and then he appeared in the first Avengers film. In this film, we see the Clint Barton life he also leads. We are introduced to his wife, played by the tough Linda Cardellini, and his two children. I really hope we see more of Cardellini in future films. Mark Ruffalo and Scarlett Johansson are given more to do as Whedon continues to develop the romantic relationship between Bruce/Hulk and Natasha/Black Widow. There is something really sweet and endearing about this Beauty and the Beast-esque subplot. The Hulk character may have not made for successful stand-alone films, but Ruffalo has been able to capture the two sides of this character and make them understandable and likeable in a way we haven’t seen before. Ruffalo partnered with motion-capture actor Andy Serkis (The Lord of the Rings) to bring more life into the character after he’s turned into the green CG giant. I was excited to see Serkis have a minor role in the film as well, and we actually get to see his face in a movie! Paul Bettany is another veteran to the Marvel Cinematic Universe after voicing J.A.R.V.I.S many times before, and he is treated with playing another character in this film. I would hate to spoil how his new character comes into play, but I will say that it’s great to finally see him on screen. New to this movie is three-time Emmy winner James Spader and hot young actors Aaron Taylor-Johnson and Elizabeth Olsen. Taylor-Johnson and Olsen played a married couple in Godzilla and play the twins in this film. They are both fantastic here and make Scarlet Witch and Quicksilver worthy characters of being in this franchise. I was hesitant after seeing the first trailer that our main villain Ultron was a CG character, but I was on-board from his very first scene, as Spader knows how to make an entrance in a very Spader-like way. Like any good villain, he steals the entire movie. Avengers: Age of Ultron is a grandiose film for this genre. There are so many characters of new and old that come into play and the stakes are higher than ever. It’s great to see supporting players from the other movies like Anthony Mackie (Captain America: The Winter Soldier), Don Cheadle (Iron Man 2 & 3), and Stellan Skarsgård (Thor) utilized this time around. There are even more, but I’ll let that be a surprise for you. There is a lot going on to fill the 2 hour and 20 minute runtime. Apparently Whedon’s first cut was three and a half hours. Here’s hoping we see that on the Blu-Ray. The biggest squabble I have comes down to those high-octane action sequences. In the first film, they felt clear, crisp, and easy to watch. With the plethora of characters in battle, the fights are so fast as they zip from place to place; I had a hard time focusing. Add in the unnecessary 3D, and the CGI starts to become very visible oftentimes making the actors look animated. It’s my continual battle with these types of movies, but I always credit Whedon’s work in the first film for making it work. Here it seems a little more muddled. That aside, there is so much to enjoy between the humor, the new badass villains, and the camaraderie of this cast. I already have my tickets to see it a second time. Is It Worth Your Trip to the Movies? This is Joss Whedon’s last Marvel entry, and I’m going to miss his contributions to this franchise.